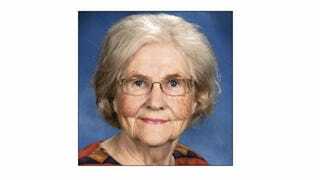 Marilyn Hagerty, the Grand Forks, North Dakota writer who rose to national prominence by writing an earnest review for her local Olive Garden, has finally conquered the Rachmaninoff Piano Concerto No. 3 of food critique: McDonald's. My first visit was to McDonald's on S. Washington Street, where I ordered a senior coffee for 47 cents one morning. And with it I had a sausage egg McMuffin. That was $2.99 and a whopping 370 calories. You know you have eaten, and I like the combination. The coffee, which is McDonald's brand, was strong and not too hot. This is one of the several places around the Forks where coffee drinkers gather to exchange the news of the day. They start clearing out mid-morning. Then people with small children trickle in to use the only McDonald's playground left around here. You know you have eaten. What a food review. My trail through the McDonald's restaurants took me to East Grand Forks, where I ordered a medium-sized low-fat latte. I got quick service and paid $3.18. I collect the little cards that come on the lattes in order to get a free one after the fifth purchase. "Not working?'' I think. I almost foam at the mouth in disgust, but I try to be pleasant. Aren't we all just Marilyn Hagertys at the broken espresso machine of life, trying to be pleasant while our steamed milk dreams are crushed before our eyes? Hagerty made her way to the fourth and final McDonald's and noted its suitability for reading newspapers, or, perhaps using computers. This is a friendly place in the morning with people trickling in and out. There are newspapers around. And like all McDonald's restaurants, the place is wired for computers. Please adopt me, Marilyn Hagerty.